NEW LOOK - Heavy Duty, stronger yet thinner plastic! Especially designed to protect against theft and show alterations. 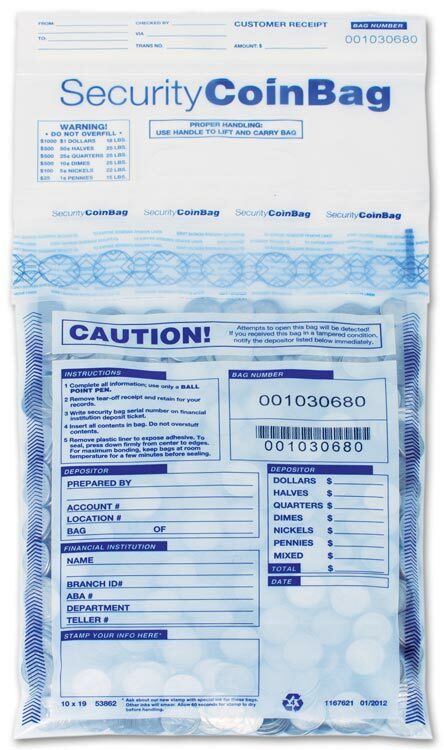 Our "Gold-level" Seal Security Deposit Bags are made of #4 recyclable plastic with unique bar-coding and numbering on bag and tear-off receipt, these special features make for easier processing, less risk of errors, convenient tracking and deposit identification. All our deposit bags meet Federal Reserve guidelines! Our new Gold-level Seal indicates our highest degree of security against all mechanical (hand-pulling), chemical (solvents), thermal (hot air and freezer spray) and moisture (licking with tongue) tampering attempts.